In order to understand the Sami concept of time from the Western perspective, we must first make the distinction between the two. Sami knowledge was based on experience in that knowledge was not obtained from a book or taught in classroom, but rather it was accumulated through repeated experiences of particular situations. Sami time was based on the cycles of nature, particularly the yearly cycle of the reindeer. Western time is based on scientific calculations and observations. From the sundial to the atomic clock, time relies on such measurements as the rotation of the earth to the number of oscillations of a particular atom. These finite measurements of time contrast drastically with the changeable calendar of the Sami. The Western concept of time is not a product of experiential learning but rather a shared careful observation made by a relative minority of the population. Without a watch or clock, most Westerners would be unable to offer what they would consider an accurate estimate of the time. 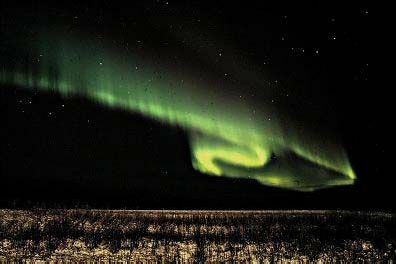 In Sami culture, knowing minutes and hours was not nearly as important as knowing what natural phenomena were occurring and which were to follow. For a people whose lives depended on nature completely, knowing when the reindeer migrate and when the salmon spawn was obviously of a higher importance than knowing the exact second, minute and hour of a particular moment in time. 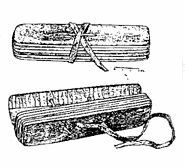 Specific days of the week were also part of the Sami calendar until the introduction of Christianity and the specific holy days associated with the religion. In order to understand the traditional Sami concept of time, the Western concept of time must be forgotten. In a world where Nature is ruler, Nature’s time is all that matters. One cannot predict the specific moment when reindeer herds migrate or ptarmigan chicks hatch; it changes from year to year, season to season. In a culture based entirely on Nature, time is relative to physical conditions, not necessarily the position of the stars or the planet, much less the oscillations of an atom. Due to the close tie between Sami culture and reindeer herding, many of the Sami calendars are based on the life cycles of the reindeer. The eight seasons of this cycle are directly related to the annual behavioral patterns of the reindeer. The herd begins the migration from the forests to the calving grounds in the mountains. The pregnant females initiate this move and return to roughly the same area every year. 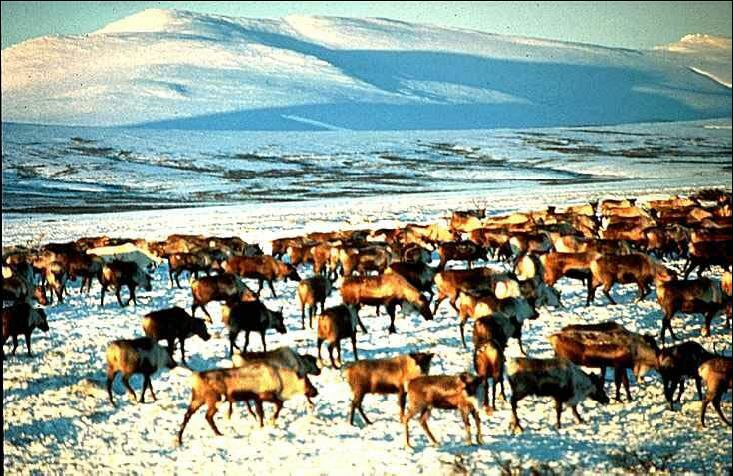 Both the reindeer and the Sami move prior to the birth of the calves. The temperature increases and the snow begins to melt. If the reindeer and Sami have not yet reached the calving grounds, travel will be very difficult as the snow turns to slush. During this time, the calves are born in the foothills of the mountains. The reindeer graze and the Sami have some time to rest and prepare for the earmarking of the calves. The calves are still very young and if food is scarce during this time the herd could be adversely affected. Much of this season is bathed in twenty-four hour per day sunlight. During this time, the important task of earmarking takes place. All the calves must be carefully marked to denote ownership between Sami families and communities. The Sami begin to prepare for the harsh winter by choosing the bull reindeer destined for slaughter. If the summer has been plentiful, the reindeer will be large and will make it through the winter. If they have not been able to put on substantial weight, the family may have to slaughter more reindeer in order to survive. This is the season of rut. The reindeer mate prior to their return to the winter-grounds. This is also the season for fishing in the mountain- rivers. It will soon grow to cold to remain here in the mountains so the Sami and the reindeer prepare for the move. 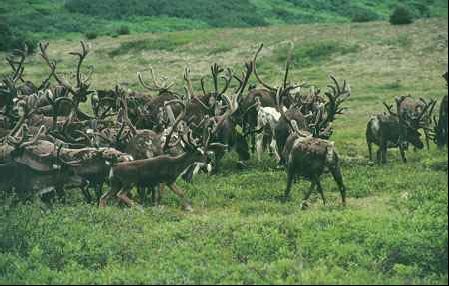 The herders lead the reindeer out of the mountains to the lowland bogs where vegetation still thrives. Under a cover of twenty-four hour per day darkness, the Sami move the reindeer to the forest, the last place to find enough food to support the herd. Here, the reindeer will wait out the harshest period of the year until the sun returns and Nature urges them to return to the calving ground to begin the cycle again. The Sami are present in each of these seasons, but they are merely following the age-old cycle of the reindeer, of birth and death. 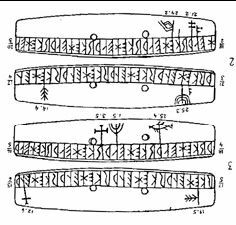 Even more specifically than the eight seasons, the Sami calendar was also divided into months that more or less match those of the Western calendar, but they are far less rigid in the time period that they define. 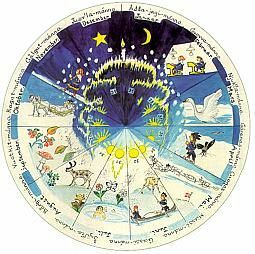 Once again, this Sami concept of time is based on natural phenomena. The Sami name for February is not translated, as the meaning of Guovvamánnu has been lost in time. However, the other month names reveal the close tie between Sami culture and Nature. Also, the influence of reindeer herding is evident and the calendar is also based on other yearly occurrences within the reindeer cycle. For example, the Sami name for April, Cuo√ománnu, is derived from the Sami word for the hard crust that is beneficial during the migration from the winter grounds to the calving grounds. The influence of Christianity is perhaps also present in the Sami name for December, but Yule is, of course, an old pre-Christian word. calendar both are strong indicators of this change in the Sami culture. previously mentioned concepts of time. concepts was another step towards the assimilation of the Sami culture. impact of Christianity upon the Sami. supports the idea of man following the flow of Nature without altering it. the Sami decide that it is time. Sami could not always rely upon the heavens to guide them in their travels. knowledge of the landscape was mandatory. 7. 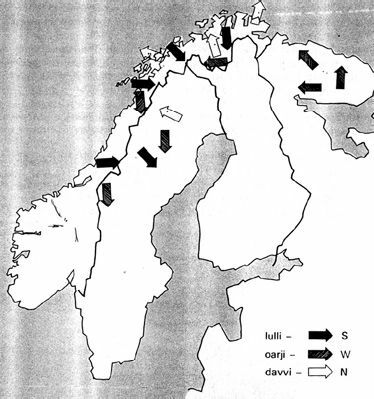 Map of Sami Directions from Davvin 3. Folkets Brevskole, 1993: 97. Sami Month Names Davvin 2. Folkets Brevskole, 1992: 144. Week Names: Nielsen, Konrad og Asbjørn Nesheim. Lappisk (Samisk) Ordbok. Bind IV Systematisk Del, 1979: 21.